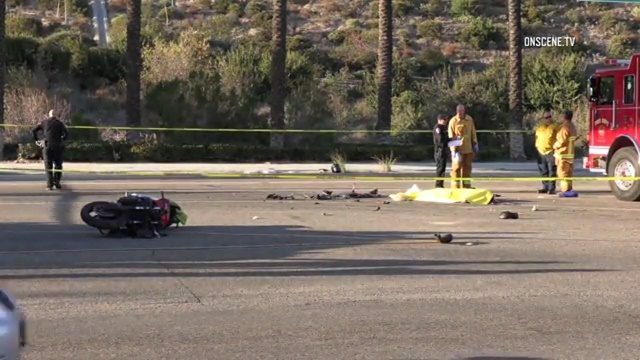 A motorcyclist was killed late Friday afternoon in a collision with a school bus near Southwestern College. The fatal wreck at Olympic Parkway and Santa Venetia Street in Chula Vista occurred shortly before 4 p.m., according to the California Highway Patrol. The victim, whose name was not immediately available, died at the scene, said Trevor Flores, a battalion chief with the Chula Vista Fire Department. Police shut down the westbound lanes of Olympic Parkway between La Media Road and Paseo Ranchero until further notice to allow for investigation and cleanup. The school bus involved in the crash was from Sweetwater Union High School District. Seven special needs students were on the bus at the time of the collision.